Here at The Medic Portal, we want to guide you on your journey to becoming a fully-fledged doctor. In order to see whether a career in the medical world is right for you, it’s useful to have an understanding of what a doctor’s role is, the career path it takes to become one and the range of medical training available after med school. First things first, so what does a doctor do? Good question, and a good place to start! 1. What Do Doctors Do? So – what do they do? A medically trained doctor is a person who is responsible for the caring for, treating and diagnosing the well-being of patients. In the UK, all medical doctors are required hold a valid license to practice and be registered with the GMC (General Medical Council). Working in medicine offers opportunities for an incredible range of challenging and rewarding career options. A life as a doctor might mean being based full-time in a hospital, working as a GP in a tight-knit community or even working to influence public health policy. There are over 60 specialist fields in the NHS that a doctor can choose to specialise in, so there are many answers to what you could be doing once you become a doctor. 3. How long does becoming a doctor actually take? To begin with, completing med school and gaining the title of ‘Dr’ can take between four and six years. This depends on your level of study upon entry to the course and whether you choose to spend an extra year intercalating (completing an added one-year BSC degree). After graduation, you’ll apply to foundation posts and complete the foundation programme, working under a mentor’s supervision. At this point, you’ll choose whether to become a medical doctor, surgical trainee or train to be a GP. The exact time frame to being a fully qualified and unsupervised doctor varies, as family-planning, career breaks and examination stumbling blocks can delay the process. 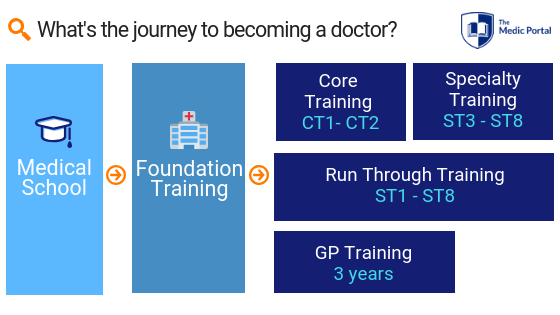 As a rough guidance, post-foundation programme, the GP training programme takes a minimum of three years, whilst other specialist training can take up to eight years. Completing a medical degree is the first step to a medical career and can take between four and six years, depending on whether a student enters their studies straight after A-Levels or as a graduate. Intercalating, meaning taking a year out to earn an added degree, would equal taking a total of 6 years to finish med school. During the final year of their studies, students must also prepare to take the Situational Judgement Test (SJT), which is required to apply for the Foundation Programme. At this stage, med school graduates complete a two- year training programme and develop their professional and clinical skills in a practical setting. Graduates are now junior doctors, not yet qualified to practice unsupervised but taking on greater responsibility for patient care. After FT1-2, med school graduates can begin to choose specialties and what comes next depends on their choice of specialty. Crucially, there are a few entry points for specialties and further opportunities to sub-specialise, but the following is a rough guide to what further training might look like. This is uninterrupted training that commences straight after the foundation programme. Doctors begin their specialty training year one (ST1), and progress to ST2 and ST3 as long as all the requirements are passed. Programmes can last around 3 years for General Practice, and 5-7 years for other specialties. This type of training is useful for those who decide on a specialty early on in their careers. This mode of training means a period of core training, followed by competitive entry to further specialty training. The majority of hospital physician specialties are uncoupled. Uncoupled options include: emergency medicine and psychiatry. Forms of uncoupled training programmes are divided into two; core training and ACCS (an alternative core training programme). A form of uncoupled training, where doctors complete a core training programme lasting 2-3 years after their foundation years, before entering specialty training. At this time, doctors select an area of medicine in which they wish to specialise in. The choices are between; general practice (GPST), surgery (CST) and medicine (CMT). CMT/ CST trainees go through various rotations before attaining a specialty training post. Where doctors compete for appointments to higher speciality training posts according to their field of choice. Training lasts between 4-6 years depending on speciality choice, and further advancement depends on successfully completing assessments. Want to know more about what being a doctor is like? Work experience is the best way to discover if a career is medicine is right for you. Find out more about it here! Want to find out more about the UCAT? You can find out all about each section of the exam here! Thinking of sitting the BMAT? You can find out more about the exam here - as well as top preparation tips.